It’s a sunny September morning in Dublin and I’m back on the northside of the city – Donaghmede – where I’ve organised to meet a local guy who is opposed to the construction in his locality of what will be Ireland’s largest mosque. I head to McDonalds outside the Donaghmede shopping centre where I’ve organised to meet him. It’s a busy Saturday morning and there’s a queue at the counter even though it’s only 11. A man with a book in his hands is watching me quizzically as I walk in. I head over to him. “George?” I ask. “Yes” he smiles, “Colette?” We shake hands and I sit down in the booth opposite him. George Sturdy has pale skin and bright blue eyes and an almost-shaved head. He looks like he’s in his thirties. The book in his hands is red-covered. It is ‘One Day in September’ by Simon Reeve about the 1972 murder of 11 Israeli athletes at the Munich Olympics. George tells me he reads a lot. I came to meet George after local Labour TD Sean Kenny forwarded me a strongly-worded email he had received from George objecting to the construction of the Clongriffin mosque. I’m here to hear his objections. George tells me that he subsequently sent an apology to Deputy Kenny because of the way the email was worded but that he is still opposed to the construction of the mosque. George lists reams of incidents that have been in the media in recent years relating to Muslims: the decapitation of a British soldier in Woolwich in May, calls for Shariah law in England, various bombings, protests, complaints about Christmas lights and alcohol consumption, attacks on homosexuals and stones being thrown at scantily clad people trying to raise money for charity. George tells me that he himself lives in the nearby suburb of Baldoyle which is about a mile and a half from Clongriffin which was just fields when he was growing up “where kids used to play”. He says that anyone he has spoken to in the area does not want the mosque to be built. I ask how many people he has spoken to. He tells me “about ten”. But he adds that “most people in the area don’t know the mosque is being built”. He says that he heard about plans for the mosque about a year ago but “I heard nothing more about it until I went on to the Nationalist Movement Ireland forum about two weeks ago”. “Are you a member of the movement?” I ask him. “No” he says “but I do follow their forum”. He tells me that he supports their policies “against this mosque and against Islam being allowed to grow in the west” but that he doesn’t support extreme right wing views. George explains that the main concern is that the area will become “Islamofied”. He cites instances of areas in England where the street signs are in Bangladeshi and says that people are concerned the area would “be taken over” and not recognised as an Irish neighbourhood. He says people are also wary of Islam because of “what they’ve seen over the past ten years or more – beginning with 9-11”. I ask him if he knows any Muslims himself. “No, I don’t” he says. He adds that when he visited Paris in 1996 the only guy who was friendly to him was a Moroccan. “I’ve no problem with any person – black, white, brown, foreign – it’s just Islam that seems to cause trouble wherever it goes”. “Muslims take offence at the slightest insult that they perceive against their religion or against their prophet” he says. “Would you be open to meeting and chatting to a Muslim?” I ask. “No, I don’t see any point” he says. “I’m not going to change their views and there’s only a point in talking to people if you can reach some compromise”. I ask him what would be a compromise. “If the mosque wasn’t built” he says “or a giant cathedral was to be built in Riyadh in Saudi Arabia”. I suggest that maybe if he met Muslims involved in the Clongriffin mosque he might understand it from their perspective. “No” he says again. “There wouldn’t be any point. It’d be like Gerry Adams sitting down with Ian Paisley”. “Are you afraid of Islam?” I ask. “Yes” he answers. “I’m afraid of what it does when it becomes the majority religion and takes over. It’s the only religion in the world that has significant problems with other religions and as their numbers grow they become more insistent that you can’t criticise their religion. They want to erode freedom of speech and freedom of doing things that don’t comply with their religion”. He cites examples of attitudes towards homosexuality, alcohol or the wearing of mankinis to raise money for charity. I ask him would he speak to a Muslim who drinks alcohol and has no problem with homosexuality. “No” he says again. “Talk is cheap – every city in Europe that has a significant Muslim population has had trouble. We only have around 40,000 Muslims here but if we had 500,000 it’d be different”. What about an Irish convert? “No, they would be even more entrenched in their views”. “I have no reason for meeting anyone of the Islamic faith” he tells me. “It’d be like meeting the Pope and trying to convert him to the Church of England”. I suggest that communication and dialogue is important for peace and understanding in the world today. “Dialogue – that’s for the leaders. Putin, Obama, Cameron”. “Basically it’s a medieval way of life and is not compatible with modern western society. If it was a Sikh temple or a Jewish synagogue I wouldn’t care”. “Would you say you’re Islamophobic?” I ask. “No, I’m rational” he responds. “A phobia is an irrational fear”. So what next? “I’d like people to get out and protest because once the mosque is built it would be too late” he says. 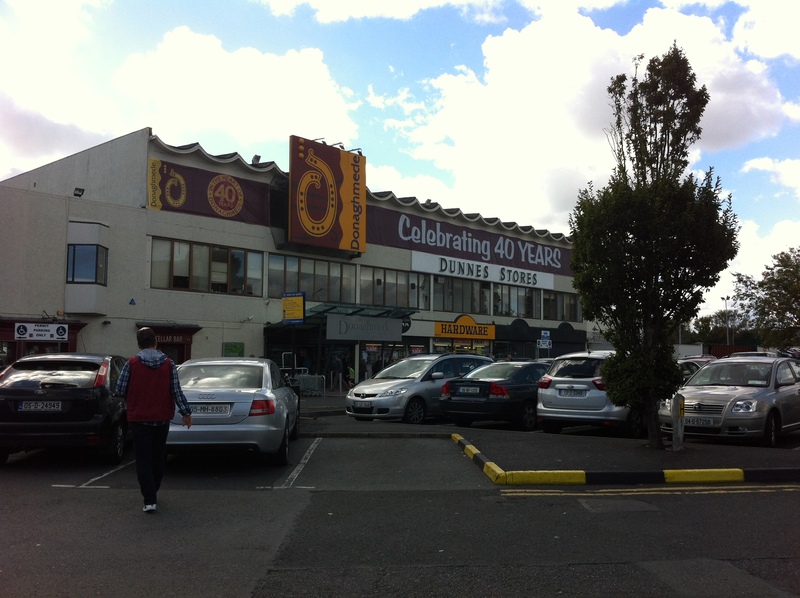 After I leave Donaghmede I take a trip back to Clongriffin which is only minutes away by car. 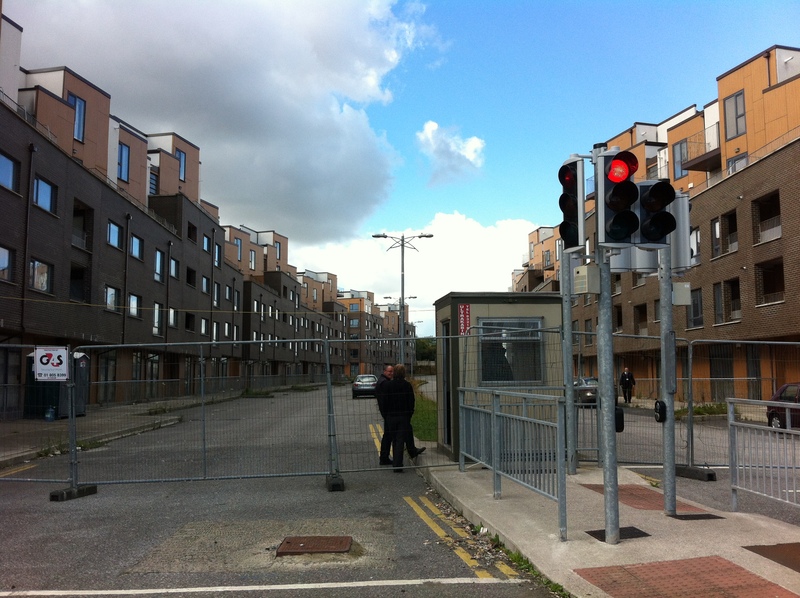 Although the buidings in Clongriffin are modern and shiny and the area is well manicured and clean it has a desolate air to it. Almost like a modern ghost-town. But with no ghosts. 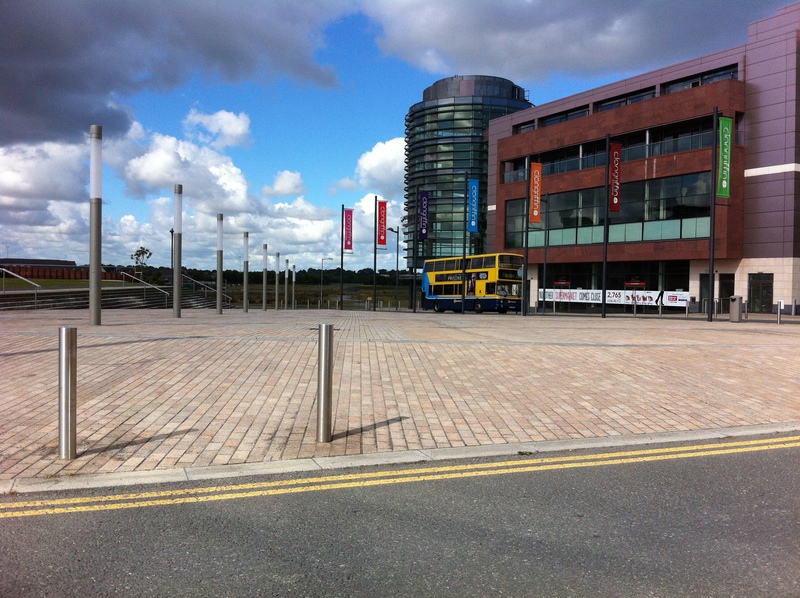 The main ‘square’ in Clongriffin on a Saturday morning. The site for the planned mosque is the green field in the background. As I drive up the ‘main street’ and around the town square I count 33 ground-floor retail units. Only a handful further down the street have businesses inside. 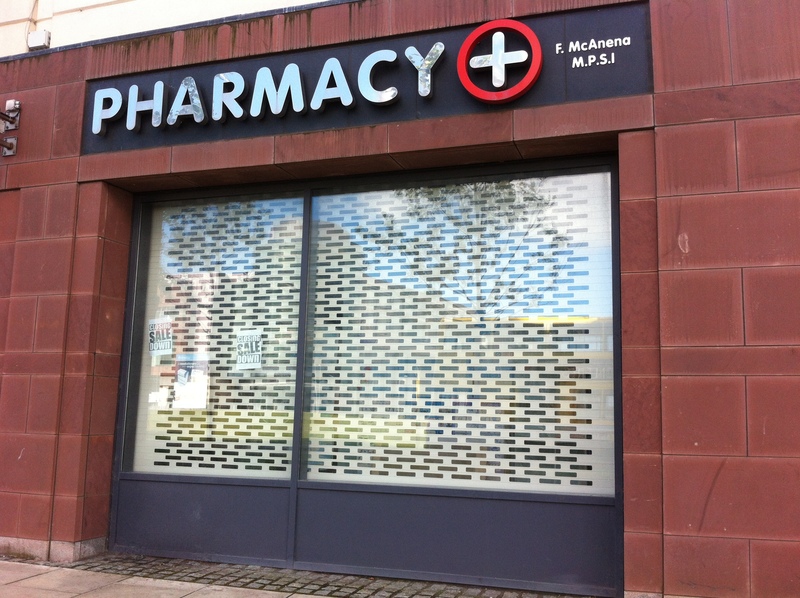 Most of the units have ‘To Let’ signs in their windows. Then there’s a Centra, an Italian chipper, a barbers, off-license and an office. That’s it. A once-used retail unit on Clongriffin main street. Now closed. As I drive away from Clongriffin I think to myself that the mosque will revitalise an area left frozen in time at the height of the boom. I’m back to the main junction and as I prepare to turn left at the traffic lights I see a large dark-coloured decrepit looking development facing me with big iron railings blocking what was once a road. There are security guards hanging out beside a little cabin. I get out of my car and go over to ask them what’s going on. “This is Priory Hall” the female guard says. I’m stunned into silence as I survey the scene. I think that this bleak space of emptied out apartments is where protests should really be taking place. The reality of the tragedy of Priory Hall hits when it becomes visible outside of the frame of the TV. Reality via the media is a different reality. People in the media are different too. The stories of real life don’t have simplified beginnings and ends. Are media representations accurate portrayals of the reality beyond? Are the Islam and Muslims of the media the same as that of not? Are the stories real? Representative? Accurate? George Sturdy thinks yes. Muslims I’ve spoken to think no. What picture would a non-Irish person who’s never met an Irish person have of me? What preconceptions? 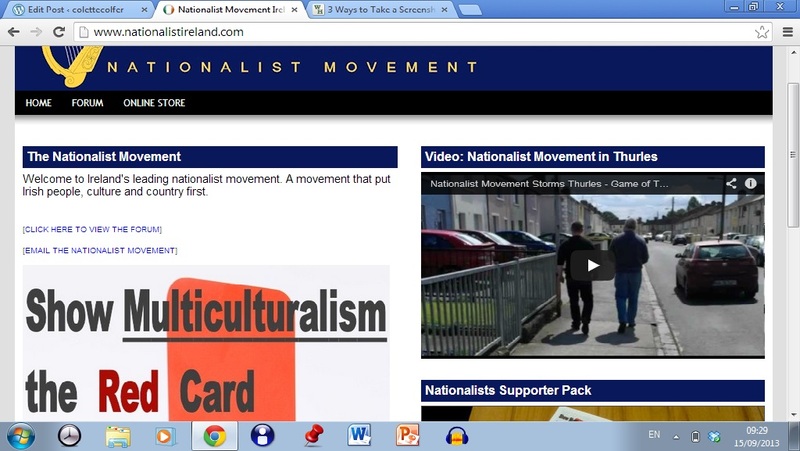 Later, at home, I google ‘Nationalist Movement Ireland’ Their home page says, in large writing, ‘SHOW MULTICULTURALISM THE RED CARD’. I think about Ireland and all the Irish people who have left over the years. Irish people in countries all over the world. No to multiculturalism? Does this mean Irish people stay in Ireland? The forum on the website has one section dedicated to ‘Real Immigrant Stories: Scammers and Criminals’ and the ‘General Discussion’ area has lots of stories about people of different nationalities and there’s also a story on the death of Hitler’s bodyguard. George had told me that he is not a member of the movement but that he did speak to one of the leaders, John Kavanagh, before meeting me. I also googled John Kavanagh. And what of the issue of meeting ‘others’ who do not share our views, opinions, beliefs, values? Should we only meet those with whom we agree? Or those who we can convince to change? Or should we meet people in order to listen? In order to understand? George won’t speak to Muslims but for the next blog I’m going to look into the issue further – I’ll be speaking to Irish Times journalist Mary Fitzgerald about Islamophobia in Ireland and I’ll speak to someone from the Clongriffin Mosque Project to get their response to George’s concerns.